The Cathedral St. Vincent de Paul Society does a lot of charitable acts throughout the downtown community. Some of these charitable acts are preparing food for Bryden House (former St. Ann's Hospital) residents and for St. Lawrence Haven community for the homeless. Bryden House is located at 1555 Bryden Road Columbus, OH 43205. Most of the residents here have very low income or receive some sort of pension from the government. A lot of the residents normally do not know when their next meal will arrive or if someone is going to provide food for them on a weekend. Along with St. Vincent de Paul Society, the Triple V group assists in providing and preparing a meal for the residents on the 2nd Saturday of each month. Meals are pretty simple such as Sloppy Joe's, hot dogs, burgers, meatball sandwiches with salad, cookies, soda or fruit punch and water. We prepare all the items in the kitchen (well normally the ones that needed to be cooked are already cooked, just reheated at the oven in the kitchen) and then bring them out to the large table as the residents form lines to get their food from the serving table. Not all residents are able to come down, sometimes, we have to bring up the prepared food in small containers and knock at their doors and hand it to them. The Bryden House is a 5 story building and people live in former hospital rooms and offices. 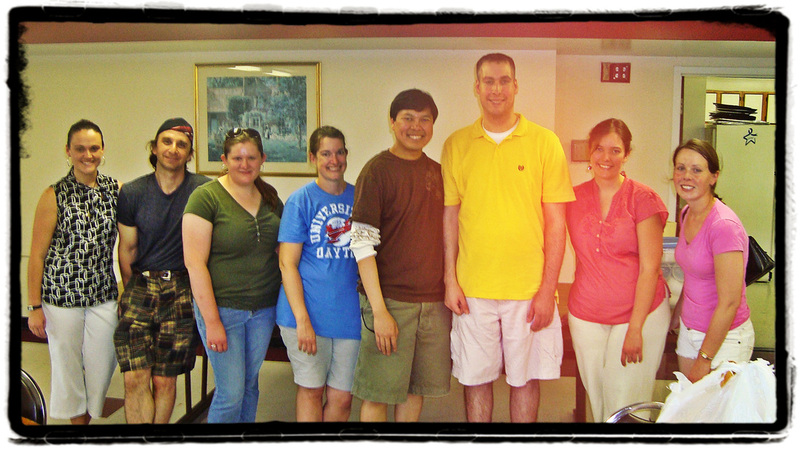 In the photo: L-R: Stephanie, Don, Crystal, Heather, JP, Tim, Mary Clare and Andrea taken last June 2011. St. Vincent de Paul Society prepares sandwiches for St. Lawrence Haven at the Cathedral undercroft every 4th Sunday of the month. They meet at the kitchen area at 9 AM and with many helping hands, get done quickly. They prepare 250 sandwiches all in all! NEXT EVENT at BRYDEN HOUSE: 2nd Satruday of February 2012! Meet at the Cathedral lot by 10:15 AM and then proceed or do convoy to Bryden House. The list of items needed for the event will be sent out by the end of the month! We should be done by around 12:30 PM after cleaning up at the kitchen! Email JP at yagroup.stjosephcathedral@gmail.com if you are interested in participating!